I just wanted to make other Twine users aware that there is an iOS7 app available to monitor your Twine(s). Supports up to 20 Twines. Faster than using the web dashboard, and allows viewing for more than 4 Twines at a time. Utilizes iOS7 background fetch technology to gather data from your Twine(s). View a data log and a temperature chart from each Twine. Provides notification if the Twine hasn't been heard from for two or more hours. Can display the current temp in the icon badge. v2.2 has been submitted to the iTunes store two days ago, hopefully should become available for Christmas. This version enhances the charting to display the values from the ext temperature probe, as well as marking the data from a new day with a red diamond. 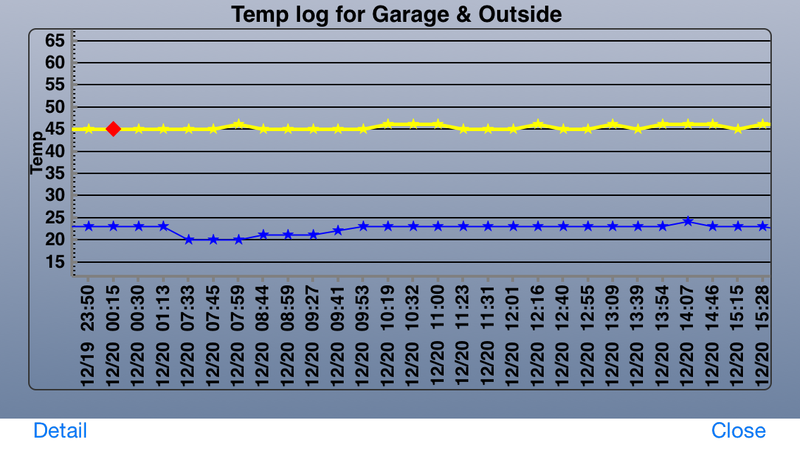 Makes it nice to log and monitor the indoor and outdoor temps from one Twine. Well done, Jim! Clearly you're doing more new development work for the Twine than the folks at SM are these days. I like your app, just got it today & have been fiddling around with it all morning. I'll gladly give my $$$ to anyone who wrings more "should have been there from the start" functionality out of the basic Twine units, so 3rd party developers are definitely our friends. Your alarm feature for Twines that have "disappeared" from the view of the servers for whatever reason is an excellent example of this type of missing (and needed!) functionality. I have an iPhone but also a Nexus 7 tablet, so is there any chance you'll be releasing an Android version of this? Or will you stay focused on IOS for right now and continue expanding the features/functions? I'm excited to see what you have planned, but also really digging the app as-is. Since I upgraded the firmware in my twine a few days ago, the charting no longer works on the iphone app. Is this a related issue, something different, what? Doug, Thank you for the comments. I think the app makes Twine much more functional for me, hopefully it is helpful for other Twine users. I am focused on IOS at the moment, and there will be some new functionality in the near future. Version 2.3 is now available. Adds control to the "Heartbeat" notification. Provides external sensor change notification. I feel like this product is going to be a cult classic thing supported entirely by people other than the company. At the price point, the Twine doesnt do much without doubling your investment in sensors. If SM was smart they would sent out a sensor package to more of their early adopters to get a buzz going again around the product.